I still had the Kind Thoughts Flourish out on my desk while I was cleaning up from today's creations, and thought I'd put together one more card. Using the Wet Stencil Technique as my inspiration, I switched mediums and used Winter Vine Glimmer Mist to add color. 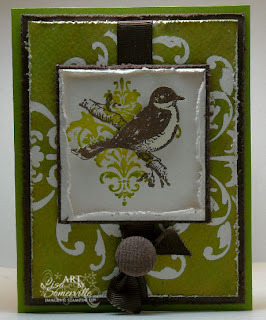 The Damask and Bird image from from Stampin' Up! 's set Friends 24-7. The Damask was inked in Olive, spritzed then stamped on watercolor paper. The Bird is stamped in Chocolate Chip over the Damask, then stamped again on Vanilla card stock and cut out and pop dotted over the stamped image. I sponged the edges of the watercolor paper in Chocolate then did the Torn Frames Technique around the edges. The Corduroy button is attached to the Chocolate Grosgrain with a Pop Up Glue Dot. I'm really happy with the outcome of this card and have a few other ideas for using the Kind Thoughts Flourish and a few other mediums...Hopefully I'll have time to work on those this ideas this week. You've created a beauty once again! This has a very French feel - or so it seems to me. I have got to get this stencil and give it a try. I'm not sure though what you used the glimmer mist on. Was it the Damask stamp? What an amazing card! I can't wait to try out this wet stencil technique - guess I'd better order that stencil! Thanks for the inspiration, Lisa! I admire your tearing, it looks so great and I can't get mine to look that good.